Ever since the Colonists threw tea off boats in Boston Harbor, Boston has been known for its water sports. Most prestigious among them: The Head of the Charles, an annual race that brings scullers from 41 states and 14 countries to the famous waters of the Charles River. 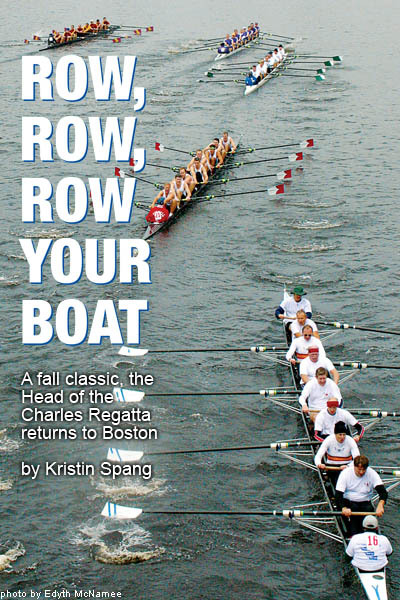 Taking place October 21 & 22, the world-famous competition is held on the challenging 3-mile upriver course of the Charles River, beginning from Boston University’s DeWolf Boathouse and ending at Herter Park on Soldiers Field Road in Brighton. A tradition established by the Cambridge Boat Club in 1965, the original race featured almost 100 rowers racing in one event. Today, those numbers have grown to almost 7,500 competitors, with 26 different categories of racing. “The Head of the Charles is special because of its tradition, and its bringing together so many rowing enthusiasts and spectators from the Boston community and beyond,” says Fred Schoch, Executive Director of the HOCR Committee. And it’s not just for professionals. College teams from all over the country compete, some of them giving those pros a run for their money. “The collegiate [races] are really the backbone of the event,” says Schoch. Whether you’re a rowing fanatic or not, the Head of the Charles offers something for everyone, including the free outdoor Row-A-Palooza concert, featuring alternative rockers Nada Surf; a Rowing and Fitness Expo where you can try out everything from the equipment used to the clothes worn by the best rowers; and the Reunion Village where you can reserve a tent for your group to watch the race, or—for a $1 donation to charity—just walk around, enjoy concessions (with seating!) and get an up-close look at the races on the newly added Jumbotron. Of course, all of these activities take second place to the main event. This year, some of the most exciting rivalries in rowing are rekindled, with Cambridge University challenging Princeton to reclaim their title in the Men’s Championship Eights, while Trinity College of Hartford, Conn. battles St. Joseph’s University to defend its Collegiate Eights title. Our fair city may not be hosting the Olympics anytime soon, but in its own more modest way the Head of the Charles Regatta continues to stand as a first-rate athletic event that turns the eyes of the world to the Boston area while celebrating an international field of competitors. Refer to listing, or visit www.hocr.org for more information. With three miles of riverbank, some spots afford more prime viewing than others. If you’re near the race’s finish line, try getting a spot by the Harvard undergrad housing area, between the Anderson and Weeks bridges. If you’re closer to the starting line near Boston, work your way to the Harvard Business School. The best sites are on the seven bridges spanning the Charles, but get there early. Race organizers strongly suggest taking public transit. Hop the Red Line into Harvard Square or Central Square, or grab the Green Line (B trains only) to BU Central, and you’ll be in the middle of the action.